Yesterday was my hubby’s birthday. Usually he is quite particular about taking our little one out because he is only 2 months. However, yesterday was different. Daddy wanted little Joshua with him. We went to church, we had lunch, spent quiet time as a family, bathed Joshua, and brought him to dinner with us. My husband, Steve, on his birthday wanted the most important people in his life to be around him. I really felt good that he made that his priority. 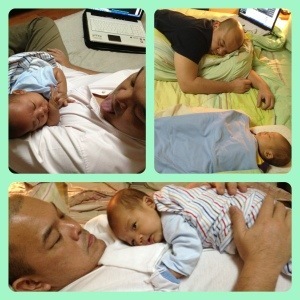 We make it a point that there will be “daddy’s time” everyday between Steve and baby Josh. 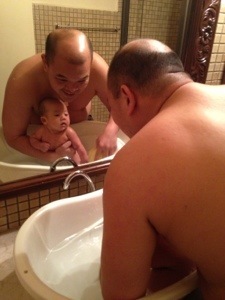 When Steve gets home from work, he hurries to shower or freshen up just to hold and play with Joshua. They have conversations ( Joshua responds by cooing), they have play time… And at night, daddy Steve does family snuggles before he goes to bed. Joshua coos and laughs, crawls on Steve’s chest, and finds rest sitting on Steve’s legs. I really enjoy watching them bond. Yesterday, Steve decided on his birthday to read scripture during lunch over his parents and siblings and over us… I look forward to that day when Joshua does that as well. I prayed over Steve that God would mold him to be the best father to Joshua and the best husband for me. I declare God’s favor over his life and that he will be a godly example to me and to Joshua. He is the leader in our home and we will serve God together. Being a good father is not inborn. It needs a heart attuned to God that is humble enough to be changed and even broken. It is a commitment that a person makes in his life to raise his family in the fear of the Lord. This is why as a wife it is important I pray for my husband, the father of my child. I release him to God and I watch God move in his life. As I love and submit to Steve, my son will grow, love, respect his father. This proverb is a reminder to Steve and I on how we are to rear our child.